this past weekend was an absolute treat. i was able to escape after teaching friday night through this morning with a few good friends. considering my schedule this year has allowed for very little down time, i have been looking forward to this past weekend for months. we escaped to a little town outside of luray, virginia for some cabin and country time. arrived late friday night, made some smores, and decompressed. 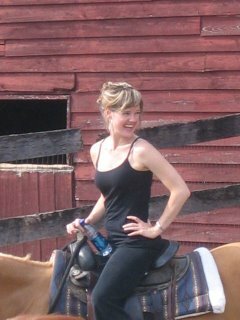 up leisurely on saturday and i had called all the local establishments to get the scoop on tubing and horseback riding. my pals simply wanted some coffee, but i was ready to dive into the country life. not wanting to rush things, we decided on a 4pm horseback ride where louis was invited and "babysat" in their handy playroom. the photo shows me on top of dear glory, a horse who had a mind of her own and loooovvvveeed running me into trees. the weekend was pure joy spent reading, planning, chatting, appreciating the beautiful vista, sipping green tea, and dining on my beau's fabulous cooking (including smore pancakes!). Have a wonderful trip, Kimberly- it all sounds so wonderful!